Quartz crystals are chiral, and exist in two forms, the normal α-quartz and the high-temperature β-quartz. The transformation from α-quartz to beta-quartz takes place abruptly at 573 °C (846 K). Since the transformation is accompanied by a significant change in volume, it can easily induce fracturing of ceramics or rocks passing through this temperature limit. The word “quartz” comes from the German, which is of Slavic origin (Czech miners called it křemen). 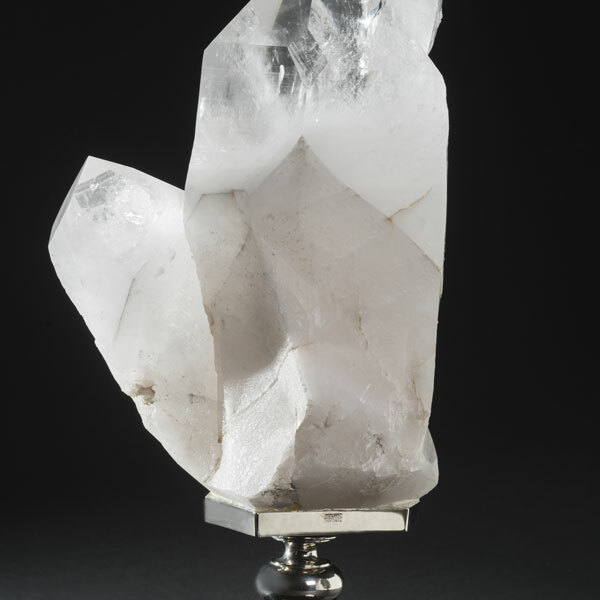 Other sources attribute the word’s origin to the Saxon word Querkluftertz, meaning cross-vein ore.
Quartz is the most common material identified as the mystical substance maban in Australian Aboriginal mythology. It is found regularly in passage tomb cemeteries in Europe in a burial context, such as Newgrange or Carrowmore in Ireland. The Irish word for quartz is grianchloch, which means ‘sunstone’. 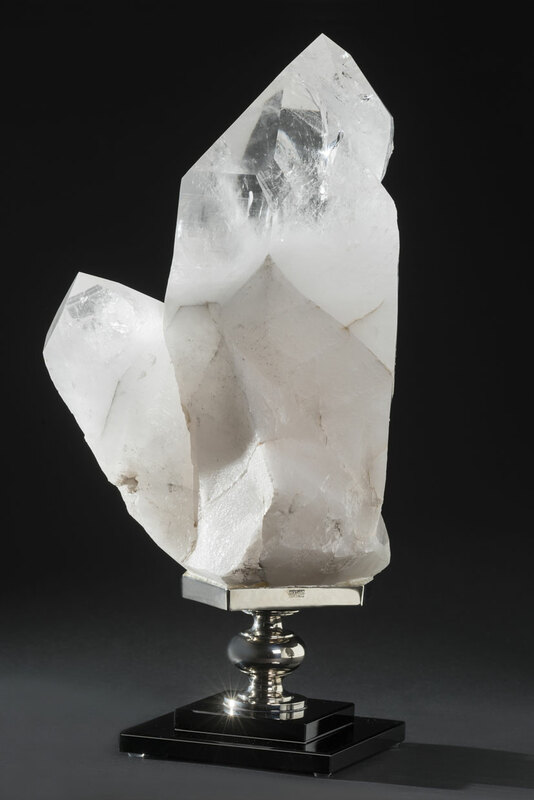 Quartz was also used in Prehistoric Ireland, as well as many other countries, for stone tools; both vein quartz and rock crystal were knapped as part of the lithic technology of the prehistoric peoples. Roman naturalist Pliny the Elder believed quartz to be water ice, permanently frozen after great lengths of time. (The word “crystal” comes from the Greek word κρύσταλλος, “ice”.) He supported this idea by saying that quartz is found near glaciers in the Alps, but not on volcanic mountains, and that large quartz crystals were fashioned into spheres to cool the hands. This idea persisted until at least the 17th century. He also knew of the ability of quartz to split light into a spectrum. In the 17th century, Nicolas Steno’s study of quartz paved the way for modern crystallography. 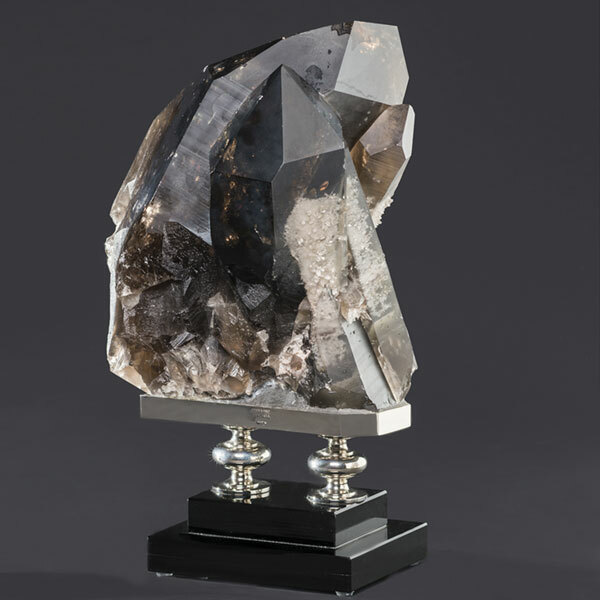 He discovered that regardless of a quartz crystal’s size or shape, its long prism faces always joined at a perfect 60° angle. 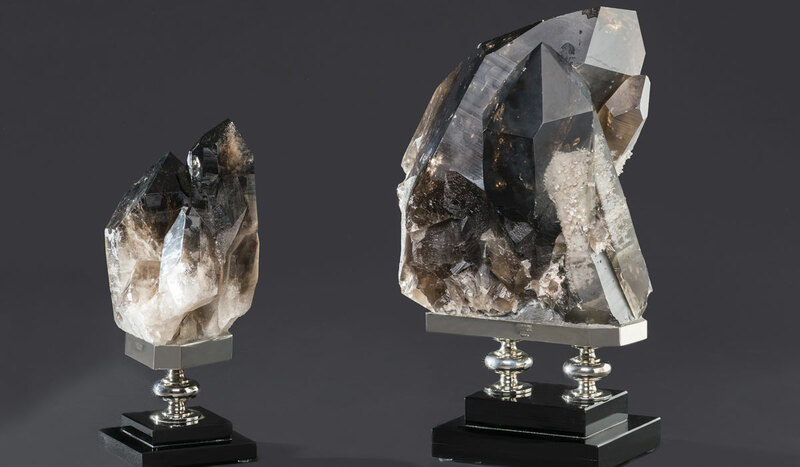 The most important distinction between types of quartz is that of macrocrystalline (individual crystals visible to the unaided eye) and the microcrystalline or cryptocrystalline varieties (aggregates of crystals visible only under high magnification). The cryptocrystalline varieties are either translucent or mostly opaque, while the transparent varieties tend to be macrocrystalline. Chalcedony is a cryptocrystalline form of silica consisting of fine intergrowths of both quartz, and its monoclinic polymorph moganite. [ Other opaque gemstone varieties of quartz, or mixed rocks including quartz, often including contrasting bands or patterns of color, are agate, carnelian or sard, onyx, heliotrope, and jasper.